As the weather is heating up in Bakersfield CA, so is the local real estate market. Here is the Bakersfield CA Real Estate Market Report – April 2018. The increased activity of homes on the market and properties going under contract shows we are now in full swing of the busy real estate season! As we closed out April 2018 we noticed that there was an increased amount of homes on the market from March. March 2018 had a total of 1,538 properties listed where April 2018 came in at 1,586. One interesting point to be aware of is that sales were actually down from March to April in 2018, April’s total sold properties came in at 595 which was a 12% decrease. Despite the drop in sold properties there was a huge 42% increase in pending properties that went under contract. With that being said I anticipate an increase in sales next month from April to May. Days on market from March to April remained somewhat flat, April came in at 42 days on market in comparison to March 2018 number of 40. All in all another good month and signs that the market is definitely moving in the right direction. With April having low days on market like March it’s still a great time as a seller to list your home for sale. During these busy months most sellers will see higher sold prices and lower days on market which are both great things for a seller. Seller’s looking to list their home in today’s market should be mindful of the recipe for success which is hiring a good agent that communicates well, follows up and has extensive knowledge of the local market, proper pricing and a proven successful online marketing campaign. If you’re considering selling your home please feel free to contact us anytime. We have a 97% valuation to sold listing ratio and offer a 100% customer service rating. Click here and check out some testimonials from our recent clients! We’ll provide you an accurate valuation so you know what your home is worth, net sheet so you know what you’ll pocket at the end of the sale and a free face to face consultation to discuss it all. We’ll also provide suggestions when we meet of items that you can do to possibly spruce up your home and make it the best it can be for an ever quicker sale for top dollar. 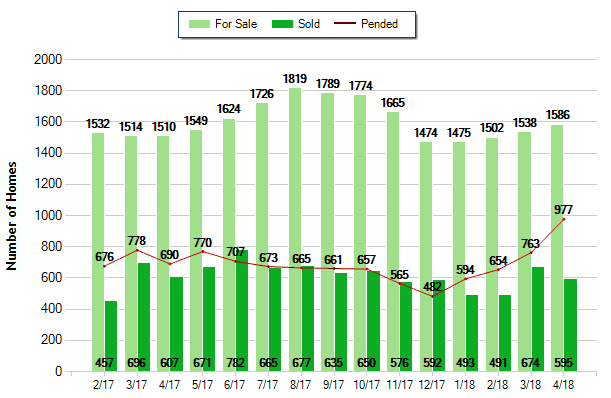 The Bakersfield CA Real Estate Market Report – April 2018 shows definite signs of the market heating up! With the market heating up so does the pricing, April 2018 average sold price came in at $245,000 which is slightly up from March 2018 of $241,000. It’s still a sellers market but with prices rising buyers won’t want to delay if they’re in the market to buy a home. Buyers choosing to purchase in the April/May time frame are often surprised that they can use their tax refund for a down payment and take advantage of seller paid closing costs to get into a home for very little money down. New home buyers will be happy to know that the average price of a home listed for sale is only $299,000. The good thing is this is only slightly higher than the FHA loan limits so with a small down payment buyers can take advantage of the current market average active list price. Of course with the days on market only being 42, buyers will want to start looking now before the home they want is gone! If you have any questions about Bakersfield CA Real Estate Market Report – April 2018 then please feel free to contact us. As always, feel free to post a comment below also.